It is important to have the best accommodation you can during your travel vacations or work travels. In this way, you can maximize your stay in a specific destination and fully relax and release all tension and stress you have. After a long day of exploration and adventures – your hotel would serve as your safe haven and sanctuary. But what if you don’t have that big of a budget? Would you settle for less? Of course not! Sakli Konak Cappadocia Boutique Hotel is located at the heart of Uchisar – the peak of Cappadocia. The hotel is an old village mansion restored in a modern and comfortable style with a touch of Turkish-inspired designs. It has 6 stone arched rooms and 1 special room with a terrace and jacuzzi. All rooms have its separate bathroom, 24 hours room service, satellite TV, personal care and hygiene products, hair dryer and tea set-up. They also serve a total Turkish breakfast consisting of more than 30 different delights including organic food. This place is recommended by the people who have already stayed here because of the cozy and natural ambiance of the place. The owner could also help you plan your itinerary for Cappadocia. For those who want to stroll around the area, you can just walk from the hotel to Uchisar Castle, Peageon Valley and Goreme National Park. You can book a room for as low as P3,277! Baby Elephant is an independent boutique hotel located in a peaceful area of Siem Reap only a short tuk-tuk ride or leisurely stroll away from the famous Pub Street and Night Market. Ideal for those who want to go out in the night and shop and wants to go back without a hassle to their hotel. They provide premium budget and affordable luxury accommodation alongside all the facilities and services of an international hotel. It has 25 rooms which are spacious, fully air-conditioned, neatly designed and decorated featuring comfortable beds made up with high quality linen. After exploring the Angkor Wat complex, you can relax by the pool and enjoy cocktails from the pool bar or eat from a full range of Cambodian and international cuisine. They are known to be an inclusive, family-friendly, and LGBT-welcoming property offering a dynamic, creative, and nourishing space for their guests. You are surely up for a memorable and amazing stay in this place. You can book a room for as low as P2,678! Cabo Vista Hotel is located near the heart of Cabo San Lucas, with its unique colonial style architecture with stonework, ironwork and Mexican decorative elements, you will feel warm and comfortable – that homey feeling! All-in-all, the hotel has 23 fully furnished rooms equipped with double beds, spacious bathrooms with shower and onyx trimmed mirrors, closets with shelves and air conditioning. Also included is a kitchen with a microwave and coffee maker, LED Smart TV, Wi-Fi, water heater, ceiling fans, safety deposit boxes, an electronics charging area, breakfast bar with two stools, desks, and a terrace with breathtaking views of Cabo San Lucas. Cabo Vista is a very short distance to most of the sites so you can walk or drive to malls, bars and nightclubs, beaches and other major sights of Cabo San Lucas. Known as the resort city, you can explore different water activities around the areas. Wet and wild! You can book a room for as low as P4,470! Splash Inn Dive Resort is located in West End, one of the best beaches on the island. It also offers an overlooking view to one of the most beautiful barrier reefs in the world. You can also enjoy diving and snorkeling on the bluest hues of ocean at this place. They have 25 comfortable clean rooms, large variety of food to choose from in the restaurant – all great tasting and very satisfying and an outstanding staff – from the welcome at the desk, housekeeping and serving staff in the restaurant. You would surely want to come back because of the attention and satisfaction the staff will be giving to you. Have a wonderful Roatan experience! You can book a room for as low as P3,676! Mint Hotel is located at the capital city of Serbia. It is a family-owned property that offers free parking with 24 hour video surveillance and free cable and Wi-Fi internet in the whole hotel. All rooms are pet-friendly, spacious, elegantly designed and naturally lit, with a flat-screen TV, a safety deposit box, bathroom and well-stocked mini bar. Their service is focused towards offering a perfect experience for travelers with a personal touch- a known characteristic of Serbian hospitality. You can roam around the streets of this European country and come home to a cozy and soothing place. You can book a room for as low as P3,145! River Palm Villa Hoi An is a miniature model of the ancient town with all rooms overlooking the river and receiving much natural lighting and enjoyable waterway landscapes. It is halfway between the old city and the beach which are easy to reach with the free bike provided by the hotel. Not only does the full equipment rooms include free WIFI, A/C, Heater, hot water shower and bathtub, fridge, flat cable T/V, but it also has spa, restaurant, and bar inside for you to order all the day and night. It is truly an ideal place for you to choose when you come to Hoian. You can achieve the tranquility and peacefulness a vacation should be all about at their villas. You can book a room for as low as P856! The Mountainaire Inn & Log Cabins is a charming boutique hotel unique among Blowing Rock’s lodging accommodations. It has eleven lovely rooms and thirteen cozy, inviting log cabins, accompanied by well maintained gardens and landscaping. Their location is perfect to walk to town and close to many restaurants. The place is also a short driving distance to all of the diverse outdoor activities the high country provides. So if you want to escape the urban city and enjoy the fresh air among nature, this one’s for you! This luxurious guest house is located on the shores of Dingle Bay, so it enjoys a fabulous view while just being a five minute walk to the vibrant center of Dingle town. The interiors of the house are a cozy, eclectic mix of antique and contemporary furnishings highlighted by tea service collections, fresh flowers, and book shelves of best sellers and mysteries. Some collectables and art are also for sale. During the day complimentary tea/coffee and baked sweets are offered. When you return after a whole day of enjoying Irish culture and traditions, evening candles are lit in the entrance foyer and you feel like you’re a special guest staying in a beloved home. If you come to Dingle, there really is no other place to stay. Great location, beautiful view and comfortable rooms – what else would you be looking for? Stay in! The multi award winning Lauriston Court Hotel is a family-friendly hotel. It is in a prime location overlooking the sea, promenade and pier, with stunning sweeping views of the bay. Winning the Best in the World for Customer Service and Tourism Partnership Award, the hotel is maintained to a significantly high standard and is tastefully decorated. From the warm welcome to the comfortable clean rooms & the friendly staff, there was a good choice of breakfast options, patio area with comfy seating, cozy lounges and bards, and a car parking. All amenities you need to have a fun-filled vacation is right here in this place. 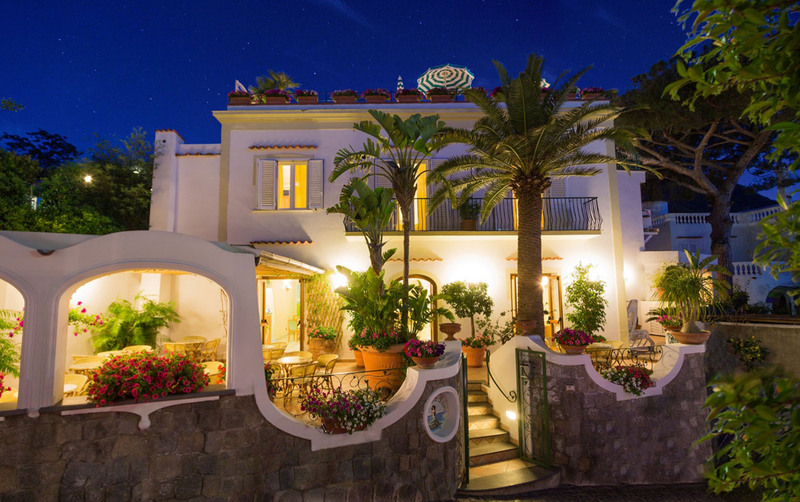 Villa Sirena is located in the northern part of Ischia. Although it is a bit remote, the owners made sure to help out their customers by offering transportation and even planning a whole day out. You will truly enjoy the comfort of Sirena because it can offer you everything you need. They prepare scrumptious and more than plentiful meals, has relaxing thermal baths, comfortable bed, and hot showers, which will make you feel like family. The island of Ischia is absolutely beautiful and if you are looking for lovely beaches, tropical gardens, thermal spas, lovely people and a small hotel with amazing staff and traditional Ischian food then Hotel Villa Sirena is definitely for you. Bon voyage!